This latest children's DVD from Roadshow features one of the most loveable creatures on the planet called Peppa who is an extremely cute and mischievous little pig who is joined by her younger brother George (another loveable favourite) and her parents Mummy Pig and Daddy Pig. 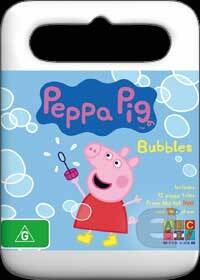 The 12 episodes contained on this DVD involve Peppa getting involved in a variety of little adventures and misadventures from dressing up or visiting new and exciting locales. The series is extremely well animated that targets the younger generation admirably with its easy to understand storylines and simplistic yet engaging animation. Although loved by all genders, Peppa will definitely be better received by the girls in the family. Kid friendly and recommended!